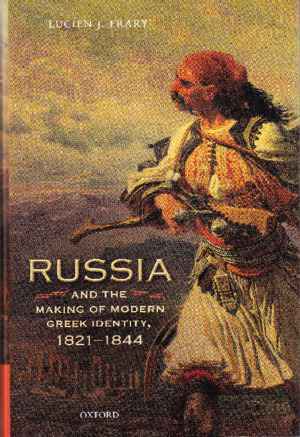 Russia and the Making of Modern Greek Identity, 1821-1844. This monograph is designed as a study on Russia´s contribution to modern Greek state and nation building in the period from the independence war of 1821 until the constitutional revolt of 1843/44. It draws on a wide range of sources with a focus on unedited material from Russian archives (mostly diplomatic correspondence) and contemporary Russian press (mostly daily newspapers). As the author rightly points out, this material was widely neglected in previous international scholarship, so its first detailed examination is very welcome. This is meant not only in terms of quantity but also of quality, because, as he states later in the text: “Viewing the development of Greek nationalism from the Russian perspective provides balance to the scholarly literature stressing the role of secular, Westernizing influences of identity formation.” (p. 124). In questioning one-sided interpretations of nation building processes, based on Eurocentric concepts of modernization, this approach appears promising and at the height of current research. The first chapter gives a sketch of the historical background, focusing on Greek-Russian relations from about the 1770s until Greek independence in 1832. It offers also interesting insights into contemporary Russian media echoes. Unfortunately, by ignoring Russophobe attitudes in pre-revolutionary Greek discourse – beginning with an outright misleading presentation of the reactions of Orthodox high clergy to the Russo-Ottoman War 1768-1774 (p. 22f.) – it gives a biased picture about Ottoman Orthodoxy without reference to the ambiguities of its much-conjured ecumenicity. Russian military efforts during the war of independence are described together with material and humanitarian aid for the insurgents, but there is surprisingly scarce information about Russian policy inside the nascent Greek state. Insofar this corresponds to actual source evidence, it can be considered an interesting result in itself, which, however, should have been discussed in more depth. Eventually, this section is more successful in mirroring repercussions of the Greek War of Independence in Russian public opinion than in analyzing Russian policy in Greece. The second chapter describes developments from 1832 until the end of the Bavarian Regency 1835 with references to Russian views about the political future of Greece. According to the author, these were notoriously misunderstood by western Europeans (p. 60f. ), because, as he states further down, “Russia desired that the Greek government remain free from foreign political influence” (p. 65), but simultaneously “attempted to implement a value system different from that prevailing in the West” (p. 66) – which sounds somewhat contradictory, however. This value system is identified with the contemporary Russian state doctrine of “Official Nationality”, based on the principle of monarchical absolutism by divine right. Whether this principle can be considered as cornerstone of modern Greek statehood, as the author asserts (p. 92), seems only partially convincing, given that Greece was not a dynastic construction and that the constitutional heritage of the revolutionary period posed a strong democratic paradigm, which, by the way, contributed significantly to the overthrow of absolutism just one decade after its introduction. The third chapter treats a major controversial issue of the secular state building project, the foundation of an autocephalous Greek-Orthodox Church in 1833. Autocephaly was fiercely opposed by conservative critics from the “Russian” party in accordance with the Tsar´s envoys in Greece. Their activities however are not further explored, unlike the titles of the subchapters suggest. Instead, much effort is spent to delegitimize Greek autocephaly as upshot of “heterodox plans” (p. 109) to destroy “centuries of church unity […] in a decision process replete with irregularities” (p. 113), whose initiators are characterized as “so-called modernizing Greeks” and western foreigners “largely inexperienced in the practices and traditions of eastern Orthodoxy” (p. 121). Central objection is that the Greek autocephaly followed a “German-Protestant model” essentially alien to Orthodoxy (p. 93f., 121). The author adopts here an argument often used by present day Greek-Orthodox fundamentalists, without taking into account that the Russian Orthodox Church had introduced the same model already more than a century before under Tsar Peter I. (This is mentioned casually in another context, p. 136). The section thus resembles more a late continuation of 19th century “Philorthodox” criticism than a historical analysis of it, while the references to Russia remain limited to repeated emphasis of her role as defender of “authentic” Orthodoxy. This comes out even stronger in the fourth chapter, “The Russian Ecclesiastical Mission and the Defense of Orthodoxy”. Created “as a unique weapon against secularizing and heterodox intrusions” (p. 125), this mission is described with much detail concerning staff, equipment and travel expenses (pp. 126-130, 148-151), whereas its actual activities in Greece seem marginal according to the source material presented (pp. 131f., 151-54). Konstantinos Oikonomos, then the leading figure of orthodox conservativism in Greece, was apparently not systematically supported by the Russians and acted largely autonomously (pp. 138-147). The whole section gives the impression that Orthodoxy in Greece had been in serious jeopardy due to heterodox machinations, which is undoubtedly a blatant exaggeration, backed only by weak source evidence (occasional petitions of Russophile clerics, monks and outlaws, p. 132ff.). Russia, it is claimed, had no other interest than the defense of Orthodoxy but was, again, misunderstood because “Unfortunately […] the other powers refused to believe that the Tsar´s concerns were genuinely religious.” (p. 154). Main subject of the fifth chapter is a detailed discussion of the conspiracy of the “Philorthodox Society” in 1839/40, which according to the author had no connection with Russia, as far as it existed at all (p. 191), because it was most probably an invention of “westernizing Greeks” (p. 172) respectively an “Anglophile plot” (p. 180) which succeeded to mislead not only contemporary observers but also later historiography (171f.). The last chapter, “Absolutism under Siege”, is dedicated to the Greek constitutional revolt of 1843 and the Russian reactions on it. A financial crisis together with external British-French pressures is mentioned as main reason for the revolt (pp. 209-215), while domestic demands for political participation are faded out. The subsequent, largely descriptive narrative points out that the Russian embassy was caught by surprise (p. 218) and discusses at length whether the reactions of envoy Katakazy – as far as he reacted at all (p. 229) – were in line with the Tsar´s instructions or not (pp. 225-231). So again there is more information about the repercussions of Greek politics in Russia than about the political role of Russia in Greece. Summarizing, Lucien Frary´s “Russia and the Making of Modern Greek Identity, 1821-1844”, puts an important question, but does not keep with what its title promises. Due to the closeness to its sources, it draws an idealized picture of Nicholaevan Russia as protector of an allegedly “authentic Orthodox” value system. In its main topic it gets trapped in its own narrative – no Russian interferences in Greek domestic politics, no dynamic agitation against autocephaly, connections to Greek conservatives “tangential at best” (p. 243), no Philorthodox conspiracy, no activity during the constitutional revolt – according to which there is hardly any reason left to assume that Russia played a role in the making of modern Greek identity in the period investigated, beyond offering a projection screen for anti-western attitudes. This could be likewise a result, and Tsar Nicholas was possibly not far from it when he stated in the aftermath of the constitutional revolt that “outside religion we have nothing in common with the Greeks. It´s folly to consider them allies […].” (p. 231). It remains, however, a task for future research to see whether historical reality was not more complex. Ioannis Zelepos: Rezension zu: Frary, Lucien J.: Russia and the Making of Modern Greek Identity, 1821-1844. Oxford 2015 , in: Connections. A Journal for Historians and Area Specialists, 14.09.2018, <www.connections.clio-online.net/publicationreview/id/rezbuecher-25938>.